The Château de Versailles, arguably the most beautiful castle in France, was and still remains a symbol of France at the height of its monarchical power and cultural splendor. Not only did Louis XIV move the political center of France from Paris to Versailles, but he brought some of the best architects and artists of the era (le Vaut, le Nôtre and le Brun, to name a few) to develop a palace fit for a god. So, what would the Sun King say if he knew there were sculptures of gaudy mushrooms and dreamy blondes being displayed amongst all of his prized possessions? Since the opening of Japanese artist Takashi Murakami’s exposition at Versailles on September 14, 2010, there has been a lot of outrage. Many art and high culture critics are upset about Murakami’s use of manga, a popular type of Japanese comics. According to Le Figaro, the idea of putting contemporary art inspired by mangas alongside the historical and royal finery of Versailles is sacrilegious. Not only is it considered by many a disgrace to the historic and artistic value of its era, but also to France’s current culture and pride. Jean-Jacques Aillagon, museum director at Versailles, defends Murakami’s exposition on French 2 television show On s’est pas couché by explaining that contemporary art rarely ceases to have a controversial first reaction. The Louvre’s glass pyramids and the Centre Pompidou were originally critiqued with indignation – Now, they are structures with universal success; that have become symbols of French culture and art around the world. Aillagon also argues that exhibiting contemporary art along with historical and “high culture” art is stimulating. The art of the old complements the art of the new. So, what would Louis XIV have to say about Murakami’s exposition at Versailles? Would he be offended by this intrusion of popular culture? Aillagon disagrees. Versailles was intended to be a place for happiness and good living, he says. At the end of his life, Louis XIV believed his palace to be too serious. He told his architects, “Mettez de l’enfance partout” (roughly meaning, put childhood throughout). NOTE: This isn’t the first time that Versailles has held a controversial exhibition. 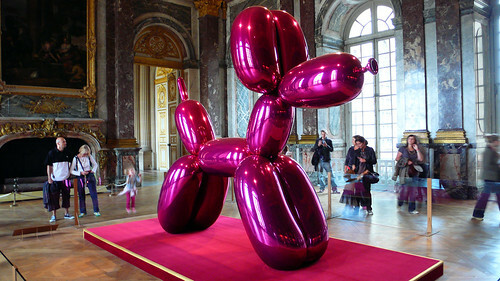 Be sure to check out contemporary art expositions by Jeff Koons (2008) and Xavier Veilhan (2009). This entry was posted in Culture and tagged contemporary art, Culture, France, French, History, Japanese, Jean-Jacques Aillagon, Jeff Koons, Le Figaro, Louis XIV, manga, On n'est pas couché, Pop Culture, Takashi Murakami, Tourism, Versailles, Xavier Veilhan. I would love to see this before it is taken down in December. The reactions that people are having to it makes me think of how people would have / may have reacted to say The Beatles playing at a theater that Bach or another beloved composer performed at.